How to eat Flax Seed? Need Ideas of Ways to eat Flax? How to eat flax seed? One of the most frequent questions I receive is: How can I eat flax seed? There are many ways you can eat flax... The important thing to do is to be creative and experiment with how to eat flax and what you like. While I eat my flax with barley like a cereal, my daughter prefers it in yogurt or juice. We also like to bake with it! You can try different ways to discover what are your and your family's favorite ways to eat flax! Add ground flax to make your Ice Cream "healthy"
Have you wondered what to do with Golden Flax seed if it is whole seed? Read about How to Grind Flax. The Omega 3 oil in Flax seed can go rancid if it is ground and then left sitting out of the fridge, because the heating process starts the Omega 3 oils to break down and denature. You can grind whole flax seed in a coffee grinder in a blender, then is best to eat the ground flax that day or put it in the fridge... which will prevent the Omega 3 oils from denaturing and going rancid. ... therefore, just like cold-pressed Olive Oil, the flax will not go rancid and you can leave the True Cold Milled Flakes sitting on your shelf easy to use every day! Some of us just don't have the time to grind flax seed! I know I don't! It has to be easy to add flax into every day life, otherwise it is so easy to get too busy! That is why we recommend the True Cold Milled Flax, so you can easily add it into your lifestyle and get all the benefits from Golden Flax! 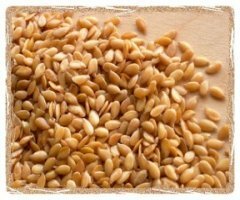 ~~~This is why the True Cold Milled Golden Flax is so wonderful! Are you looking for recipes using Flax seed? We have Yummy and Healthy Flax Recipes you can try. Flax will help extend your budget by giving your body the nutrition it needs and making you feel fuller faster and longer. 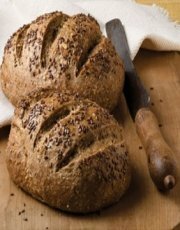 Have you wanted to use flax in cooking and baking, but are not sure how? I cook and bake with flax all the time (with all recipes-even if they aren't specific flax recipes); I like to add a little here and there and experiment. Are you baking or cooking and want to substitute flax seed in the recipe? You can also add some ground flax (for the benefits) and some whole seed (if you like the crunch) to recipes such as breads, soups, etc! Because Flax is a FOOD, it is important to be creative and find new ideas and ways of how to eat flax seed. It is worth it to find ways you like to eat flax seed because of it's many health benefits for you! Enjoy your journey to better health! Read about the many Healthy Flax Benefits. Want to read Flax seed Reviews and Customer's Flax Stories? Read more about Cold Milled Flax Seed. Buy Quality Golden Flax and eat Healthier today!